« Back where they belong!! Forget about tonight, on to the next game. That was the mantra Tuesday as the Coupeville High School boys basketball squad headed home from Port Townsend. A rough shooting night doomed them against a confident RedHawks team in a 55-27 loss, but, tomorrow is, as they say, another day. Wednesday will put the Wolves, now 1-1 in Olympic League play, 3-8 overall, back in their home gym. And, instead of Port Townsend (4-1, 7-5), the foe will be Chimacum (0-3, 0-7). Sitting in a tie with Klahowya (1-1, 4-7) at the moment, Coupeville has a prime opportunity to claim sole possession of second-place in league play with a win against the downtrodden Cowboys. To do so, the Wolves will need to play like they did in the first quarter Tuesday. Just maybe not like they did in quarters two and three, and definitely not like they did in the final eight minutes. Up 12-11 at the first break, with senior guard Hunter Smith already having tossed in nine, things seemed to be going swimmingly for CHS. Then a lid dropped on the rim for the Wolves. Outscored 15-4 in the second, things went downhill steadily from there for Coupeville. 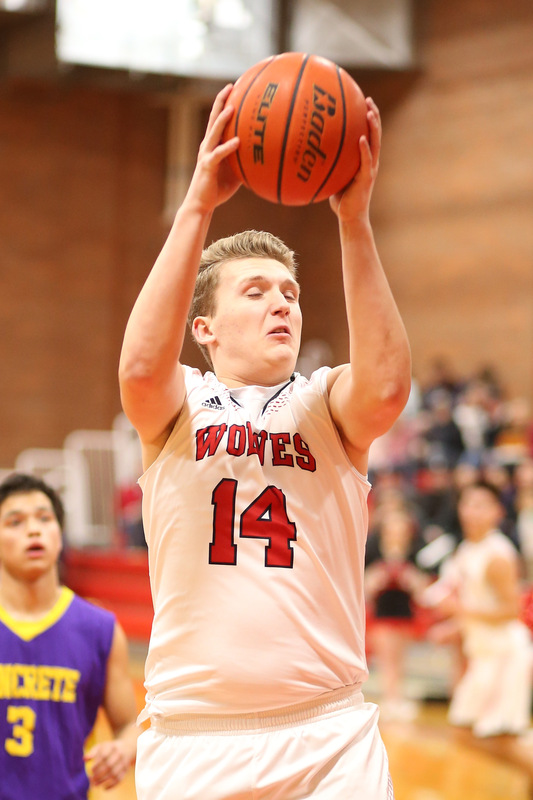 A 19-11 RedHawk run in the third stretched the lead out to a comfortable margin for the home fans, before a 10-0 fourth quarter added a bit of salt to the wound for the Wolves. There weren’t a whole lot of bright spots for CHS, but it did out-shoot its hosts at the free throw line, tossing in four of five freebies to Port Townsend’s 2-5 showing. Smith paced the Wolves with 13, which lifts him to 670 for his career. He passed Wade Ellsworth (659), Pat Bennett (659) and Foster Faris (668) Tuesday, moving into 20th place on the Wolf boys basketball career scoring chart. Joey Lippo backed Smith with seven points, while Ethan Spark (5) and Hunter Downes (2) rounded out the somewhat-limited offensive attack.